Off-the-Grid Strawbale Cabin - J & N Roofing Maintenance, LLC. This home designed by David Arkin and Anni Tilt from Arkin Tilt Architects is sustainable and helps the owners follow an off-the-grid lifestyle. This is a vacation house and is located in the forests of Nevada and it would be perfect for a young couple. The is a main living space downstairs and an upper level with extra space and a bath. There is also additional space for guests or children. All the materials used in the construction of this cozy cabin are high quality and time proof, so it would be a great long-term investment. The 872 sq.ft. 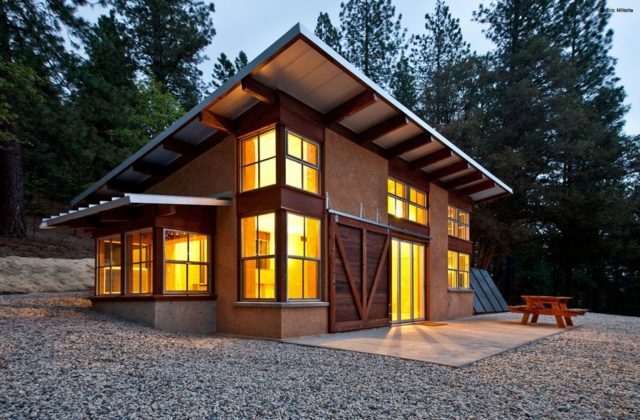 cabin is a hybrid straw-bale home. That simply means that some of the walls are conventionally built with dimensional lumber, the roof is made of SIPS and the other part-the main volume in this case-is built with straw bales.